Here's why these 10% yielders are taking a dive, with two top dividend stocks to buy on the weakness. Business development companies, or BDCs, make billions by investing in private businesses. And they're some of the biggest yielders on the stock market, frequently yielding more than 10% per year. But as of late, the biggest story is that these big dividend payers are getting crushed. An index of public BDCs is down by nearly 10% in just the past month, wiping away roughly one year of dividend payments. It's rare for BDCs to move much more than one percentage point in any given day, making the sector's 10% decline significant. BDCs seem to be in the crosshairs of two big trends. First, they're small-cap stocks. And small-cap stocks, as a whole, have taken a breather in the past few months. 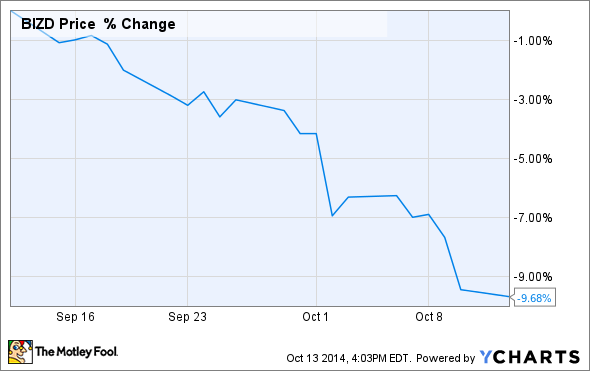 The Russell 2000 index is now down about 8% for the year, with the bulk of the losses coming in the past month. Secondly, alternatives to BDCs have turned down. High-yield bond yields have jumped considerably, according to data from Bank of America Merrill Lynch, in response to plummeting prices. Likewise, leveraged loans, which many BDCs hold on their balance sheets, traded down to a 15-month low in September. The average loan now trades at $0.97 on the dollar, compared with $0.99 in July. And further hurting the industry is the exodus of investor capital. Investors have yanked $7.1 billion from leveraged loan funds this year, of which $1.4 billion is estimated to have been pulled in the week leading to Oct. 3. A buying opportunity or popping bubble? In September, Carlyle Group executives said that inexpensive leverage was tempting the firm to seek out investments in the smaller middle market, where BDCs do the bulk of their financing. This obviously leads some to wonder whether middle market loans got just a little too hot, too quickly. BDCs have some insulation from trends in the middle market, given that they finance smaller transactions and usually seek to avoid the most liquid investments. That said, their declining portfolio yields are evidence that some frothiness was finding its way into their portfolios. Without a crystal ball in hand to predict when this credit cycle comes to an end, using this opportunity to buy BDCs at less than book value seems like the best bet. At prices below net asset value, investors get the opportunity for share price appreciation in combination with ongoing dividend yields. The largest BDC, Ares Capital Corporation (NASDAQ:ARCC), looks interesting, as shares now yield about 9.9% and trade at a 6% discount to net asset value. Ares Capital Corporation is not only the biggest BDC by assets, but it's also one of the longest running and best performing, even over the 2008 credit cycle. Alternatively, FS Investment Corporation (NYSE:FSIC) yields about 8.8% and trades at a modest 1% discount to net asset value. FS Investment Corporation is one of the newest BDCs on the market, having gone public after a lengthy stint as a nonpublic firm. Its external manager's relationship with GSO Blackstone should give it an upper hand in finding some of the best opportunities in a fragmented middle market lending industry. Investors using today's low prices to buy upper-tier BDCs at discounted prices should have the opportunity to collect big dividends while waiting for capital appreciation to bring shares back to a small premium to book value. That's a winning situation all around.